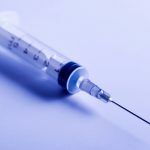 Last week, the U.S. Food and Drug Administration (FDA) released information regarding import refusals for December. Last month, the FDA reports that only 1 out of the 105 (0.9%) total seafood entry line refusals were of shrimp for reasons related to banned antibiotics. Myeik Zenith Industrial Co., Ltd. (Myanmar), a company that is not currently listed on Import Alert 16-124, Import Alert 16-127, or Import Alert 16-129, had one entry line refused for shrimp contaminated with veterinary drug residues by the Division of Northeast Imports on December 29, 2017. This refusal marked the first time that the FDA has reported refusing a shipment of shrimp from Myanmar for reasons related to banned antibiotics. Yantai Wei-Cheng Food Co., Ltd. (China), a company that has not been exempted from Import Alert 16-131, was initially reported to have had fourteen entry lines refused for shrimp contaminated with veterinary drug residues by the Division of West Coast Imports on September 7, 2017. With these adjustments, the FDA reported refusing just 55 entry lines of shrimp for reasons related to banned antibiotics in 2017. 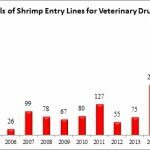 As shown in the chart below, this is the lowest total number of shrimp entry line refusals for banned antibiotics reported since 2012. Other than 2012, there had not been less than sixty entry line refusals of shrimp reported for banned antibiotics since 2007. There is no obvious reason for the sharp decline in the number of the FDA’s shrimp entry line refusals in 2017. Other major shrimp importing nations continued to report significant detections of banned antibiotics in shrimp imports, particularly from India and Vietnam. Instead, at a time when the European Union has mandated that one out of every two shrimp shipments from India be tested for banned antibiotics, the FDA’s reporting in 2017 implies that significantly less testing of shrimp shipments was conducted in 2017 compared to prior years. Such a conclusion is further supported by the fact that a significant portion of the total shrimp entry line refusals in 2017 can be traced to a single company. Specifically, over one-quarter of all the shrimp entry line refusals for banned antibiotics (15 out of 55 or 27.3%) were attributed to a Vietnamese company, Minh Phu Seafood Corporation, and its affiliate, Minh Qui Seafood. Again in 2017, the FDA’s reporting indicates that the issue of banned antibiotics in shrimp continues to be concentrated in only a small number of nations. In particular, 85.5% (47 of 55) of all shrimp entry line refusals for banned antibiotics last year came from just three countries: 19 of the shrimp entry line refusals in 2017 were of shrimp imported from China (including Hong Kong), 16 were of shrimp imported from Vietnam, and 12 were of shrimp imported from India.